I love the color of this top and the flowiness (is this a word?!) of it. Super comfy and cute. I also love this coral color paired with animal print. Love this blouse. Gorgeous and the coat is fabulous. I'm doing a link up this Thursday April 11. Show me your favorite spring trend. Woudl love it if you joined. I'm also giving away a $300 gift card to Gap. Check it out. Great shirt!! I love the color of it and the coat you had over it in the first few pictures! The coral color is gorgeous on you! That color seriously looks beautiful on you! I love this look! 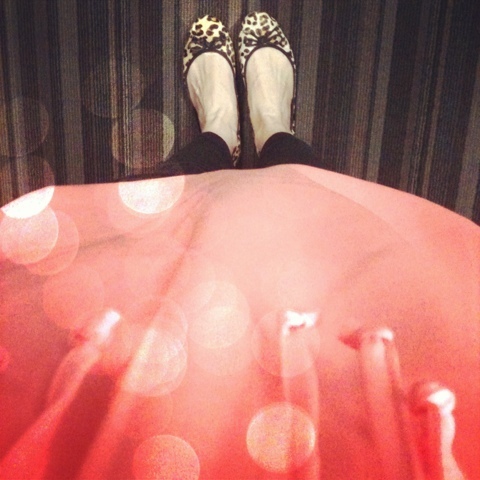 The leopard flats and cream colored coat complete the ensemble:)!